When Lily Zhang plays table tennis, it is like a full body explosion. In the vast and storied history of the Olympic Games, it’s unlikely there are very many athletes whose march toward the peak of the sporting world — began in a laundromat. But that’s exactly where the love of table tennis first tumbled into the life of then 7-year-old Lily Zhang —an introduction that began in a faculty laundry room on the Stanford University campus. These days, Zhang's "spin cycle" is all about the sport she represents, in which she easily qualified last week for her second consecutive Olympic Games to be played in Rio this summer. Each day, Zhang heads to the Indian Community Table Tennis in Milpitas where she trains for hours with a series of coaches. What was once a laundry room passion has turned into a life-consuming obsession — replanting a regular social life with a quest to climb to the top of a sport previously relegated to backyard parties. When Zhang plays table tennis, however, it is like a full body explosion. Arms flailing, feet gyrating precisely as if triggered by mechanical motors, steely eyes bearing down on a tiny white ball and then — smash. It is violence and grace with each swing of the paddle. Zhang took this year off from her studies at the University of California at Berkeley to train full time for the Rio Games. She doesn’t lament the sacrifices she’s made for Olympic dreams; having to cut-back on dinners with friends, parties and typical college life. Life, like table tennis, is about fixing your eye on the spinning ball. Following her initial laundry room foray into table tennis at age 7, Zhang joined an actual table tennis club, which only cranked up her passion for the sport. By age 10, she made the U.S. National Team and began playing in tournaments. 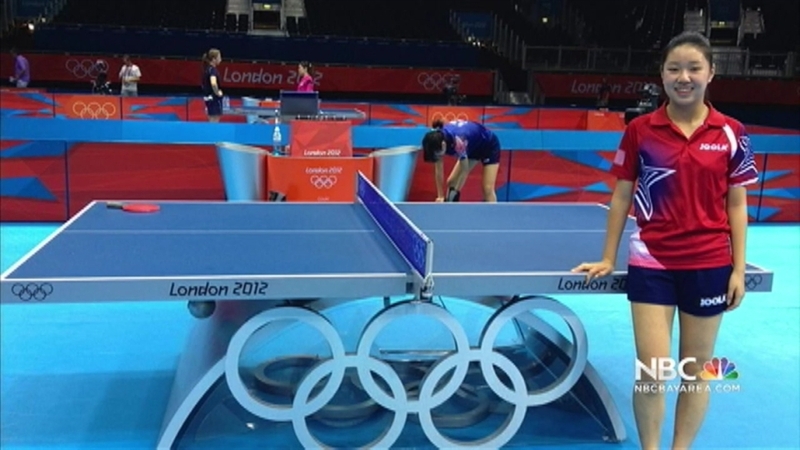 That ‘someday’ turned out to be 2012, when Zhang played in the London Olympic Games. Though she didn’t take home a medal, she did take home a life’s worth of experiences and an even more vigorous passion for her chosen sport. Over the past four years she’s ramped up her training and focus, spending several months this year training in Europe where table tennis enjoys a higher profile. “This time around I think I’m definitely a lot more experienced and a lot more prepared,” Zhang said. But Zhang isn’t so serious about the sport she can’t have a bit of fun with it. There are even times when she admits to attending those backyard parties where table tennis is still known as ‘ping-pong,’ and ripe with possibilities for a table tennis hustler. “You go and you tell them you don’t know how to play,” Zhang said with a mischievous grin, describing the surprise of her victims when she finally reveals her table tennis superpowers. Still, Zhang is serious about raising the profile of table tennis in the United States from backyard pastime to legitimate sport. Eventually she hopes the U.S. will regularly share the podium with current table tennis powerhouse countries like China and Japan. “Hopefully in the future it will be a sport that’s taken very seriously in America,” Zhang said, anxiously eyeing the empty table awaiting her return to practice. That table is a long way from the laundry room. But maybe it’s only mid-journey from the mountain she eventually hopes to climb.